This is how my life has been feeling for the last months. I finished my studies, got a certificate, became a sworn-in translator and got a new job. There was a lot to do – more than can ever be done, it seems. I’ll try to catch up on everything, on movies, music and travelling, but there are a few… more or less important things that I have to attend to, too. So please bear with me and be patient. 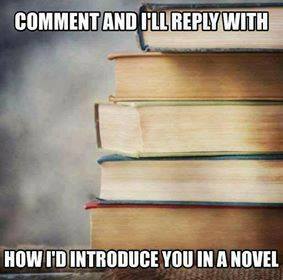 I promise interesting stories and reviews. There is something about horses that makes us humans, at least many of us, go “AAAHHH” in wonder and awe. They helped us conquer the world, carrying the heavy loads and pulling ploughs, trees, chariots and cannons, they are representative and prestigious in their elegance and the probably most popular companion for little girls. They have been bred and trained to be anything we desire: from cannon- and drum-horses during the wars we fought amongst each other, over plough- and tree-tuggers to the dancing horses trained to jump and twist and turn in Piaffes, Caprioles and Courbettes. We have wandered, warred and conquered, become peaceful, settled and worked the land – and the horse has always been with us, mild-mannered and submissive enough to follow the lead from above. Often they follow us into situations they would, as flight animals, never engage in on their own accord because we trained them to lose their fear of certain things and situations. This entails entering a very small and claustrophobic space, such as a trailer, which is per se harmless and necessary so we as owners can move the horse to a different place (in case of illness or change of stabling). Every horse owner will agree with me that it can be a tricky task to train a horse to enter such a trailer, but it also can be done in a way that the horse might even enjoy staying in there without fear and without being stressed because the horse has learned that it won’t be hurt and trusts its owner. The time it takes to teach a horse is, naturally, dependant on the disposition of the horse. This also entails staying calm in the face of flapping, fluttering barrier tapes, screaming kids, balloons and colourful (even though they can only see yellow and blue) balls because a horse that does not shy from these “dangerous” things is a safe horse for owner and horse itself. Just imagine riding out and then there is a field surrounded by barrier tape to keep people off it. Your horse shies backwards into a ditch, you fall down, your horse gets hurt, you get hurt and all that could have been avoided by the horse knowing barrier tape as something harmless where the worst thing that happens is to be given treats for being a good boy/girl. We did that with our horses so they would be calmer, more dependable and less stressed themselves. It is good to know that you don’t have to worry about every little thing since your horse will pick up on your worry through your terser signals and then it will become unsettled and more likely to shy even in a normal situation. Now, it was again high-carnival-time in Germany. Mainz, Düsseldorf, Köln… all the Rhine-cities were filled to the brim with people who wanted to watch the big “Rosenmontags” parades in which also horses were part of the show. And it happened: two horses lost their heads, ran into people and a truck. People were hurt, the horses were allegedly hurt, too. 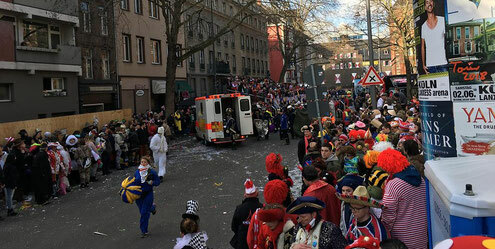 According to the Kölner Rundschau (https://www.rundschau-online.de/region/koeln/karneval/koelner-rosenmontagszug-pferde-prallen-mit-kutsche-gegen-tribuene-29686336-seite2) they did not sedate any horses – which is good in my opinion –, checked their health and their suitability individually before they were allowed to start. The riders and the leaders (every horse has a leader that might help in a stressful situation) were also checked and had to be in possession of a certificate that ensures their aptitude to deal with stressful situations and ride well**. All these precautions haven’t stopped this accident to happen. https://www.express.de/koeln/kutschen-unfall-im-rosenmontagszug-jetzt-aeussern-sich-die-treuen-husaren-29692310), I see no barricades, nothing to keep the people from running to the horses and touch them, nothing to keep children from running between the horses on their hunt for sweets*, which is a severe lack in health and safety restrictions. Horses can be trained to do a lot and bear a lot while keeping cool during all of this – just think of the police’s riding forces – and as Dr Zeitelhack, a veterinarian for horses, states in the interview of the Süddeutsche Zeitung: “Wenn die Gesamtsituation stimmt, also Reiter und Pferd erfahren und eingespielt sind, muss man in der Regel keine Sorge haben, dass etwas passiert. Wenn ein Unfall mit Pferden passiert, ist der Mensch Schuld“*** (-->“if the situation is under control, meaning horse and rider are experienced and a good team, one usually need not be afraid of something happening. If an accident that involves horses happens, the human is at fault for it”), but horses are still flight animals, prone to run away when they feel threatened and – in this case – are hit by flying objects. It seems that some very intelligent person thought it a good idea to throw something at the horses. The police are investigating the record of an eyewitness who stated that they saw someone throw a bottle at the horses, which is absolutely unacceptable. I was flabbergasted. I know, I grew up with animals – my aunt had had two Greyhounds since I could remember, we had two horses since I was six, I also owned a cat and my friends had the usual odd mix of hamsters, cats, dogs, guinea pigs and rabbits – and this is not something that every child can boast of, but this guy was middle-aged, somewhere around 40, and he had no clue how to NOT behave when an animal was around and that his actions could have a potentially fatal outcome. I told him then sternly that it was a very stupid thing to do what he did, that he could throw all the confetti he wanted but not at horses because they might bolt and hurt many people and themselves. He was not happy to be told off, refrained from throwing confetti at the rest of the horses in the parade, though. I hope a made a lasting impact there. Throwing confetti might be meant innocently, which throwing a bottle decidedly is not, but this confetti throwing man is a symptom of a far vaster problem: lacking important knowledge. I don’t think it necessary to ban horses from these kinds of festivities and parades, but the public needs to be educated, especially since many children nowadays have no contact with animals at all. Some believe that cows are naturally violet due to the Milka-cow, and a survey has shown that nearly 1 in 10 American adults believe chocolate milk to come from brown cows (http://www.independent.co.uk/life-style/food-and-drink/american-chocolate-milk-brown-cows-study-us-dairy-innvoation-adults-a7793016.html). That is more than worrying. These people have not only no idea what they are eating, they also have no idea how to treat these, or any, animals. This is shown in people throwing confetti at flight animals without having a clue of the danger their actions put the people and animals in. Concerning these probably drunken… geniuses who threw bottles at horses, much more police must be in attendance of such parades and sort drunkards like them out. I’d recommend supervised social work in a stable or animal shelter as punishment. Also, the streets need to be broad enough and have barriers to ensure space between crowd and animals, which seems to have been lacking on some, if not many, stretches of the way the parade went. If there is not enough space, then this stretch can’t be filled with and overseen by the crowd. This would also give everyone in the parade a few seconds to sort things out with everyone watching and the animals would have a few calmer stretches to relax a little more. Concerning the people and children who do not want to hurt anyone but endanger everyone in their cluelessness: an announcing wagon in front of the parade and maybe one in between that tells people to not throw anything at the animals because they might shy, bolt and hurt someone would help a lot here. I am sure that the man I reprimanded would not have thrown anything if he had known beforehand. It also seems that the horses, in this case, had already bolted before but could be contained then until someone threw something at them. If that is the case, not only poor taste in jokes (again, I can find nothing funny in throwing things at animals) but also poor judgement has led to that accident. The horses would have had to be taken out of the parade immediately and escorted away from the crowd to be calmed down. Not many people would have missed that particular coach. It is always a heated discussion whether horses should be part of such parades. It makes me very sad to see horses hurt and mistreated in such a way and I wish it would never have happened. But it is not the horses’ fault, as I well know. After growing up with horses of some considerate character I know that there are horses who actually like these sort of things. There was one that would have done everything for its owner because he trusted her absolutely. If she said jump, he only asked “how high?” knowing she would never get him hurt. He was a horse you could depend on – intelligent and bureaucratic to a fault. One of ours, Eike, a small copper-coloured half-thoroughbred mare was skittish and crazy in some situations (riding through a forest she was absolutely convinced that this very tree stump would try to kill her if she passed it) but then again, on a dressage tournament, she was the most relaxed I have ever seen her, neither batting an eye at a bolting, bucking horse called Firebolt and nor flinching when a balloon burst. Maybe she had missed her vocation and should have become a therapy horse for children whom she loved – the smaller the better. She was also great with dogs, come to think of it. What I am trying to show with these examples is that horses have characters and for a parade that size you need horses that have the temper to bear all that hubbub with a sigh and a huge portion of goodwill towards the people around them. When you find such a gentle soul you need to train them very carefully and make sure that they are not endangered by idiotic human beings. I bet these horses were gentle and had proven their nerves many times (as they were checked concerning that, too), but even so, they are still flight animals, prone to run when hit – especially from a side they cannot see very well. I would run away when someone throws a bottle at me. I might stop after a few metres, but, then again, I am a human and not a flight animal. It makes me sad to write about this accident because it could have been prevented by education and presence of the police. I hope that both humans and animals are soon recovered from their injuries and that there is no lasting damage. I also hope that everything is cleared up and that the perpetrators are caught and brought to justice (as I said: many, many hours of supervised social work in a stable and/or shelter!). The safety of animals is an important topic to me and I hope that the future generations will know how to behave and learn how to treat these precious beings so that such accidents do not happen again. I also hope that the carnival cities draw the right conclusions from this and install safety measures to keep animal and humans safe, sound and happy. * Traditionally, sweets or even small toys are being thrown into the crowd from atop the big wagons.